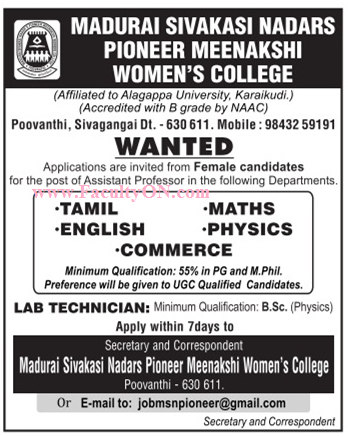 Madurai Sivakasi Nadars Pioneer Meenakshi Women's College, Sivagangai has advertised in the DINAMALAR newspaper for recruitment of Assistant Professor (Female Candidates) / Lab Technician jobs vacancies. Interested and eligible job aspirants are requested to apply within 07 days from 15th April 2018. Check out further more details below. About College: Madurai Sivakasi Nadar's Pioneer Meenakshi Women's College, located at Poovanthi, in Sivagangai district of Tamil Nadu, is a self-financing women’s institute. The college was founded with the aim of providing qualitative higher education for girl students in and around Sivaganga. Madurai Sivakasi Nadar's Pioneer Meenakshi Women's College is affiliated to Alagappa University and recognized by University Grants Commission (UGC). The college offers undergraduate and post graduate programmes in Arts, Science, and Commerce faculties.